Why We Still Mine Coal As residents of Montcoal, W.Va., mourn the deaths of at least 25 coal miners in the deadliest U.S. mining disaster in more than two decades, Americans may wonder why the country is still using a fuel that can be dangerous to produce and damaging to the environment. Coal is an inexpensive and efficient way to generate electricity and is likely to remain a power source for the foreseeable future. 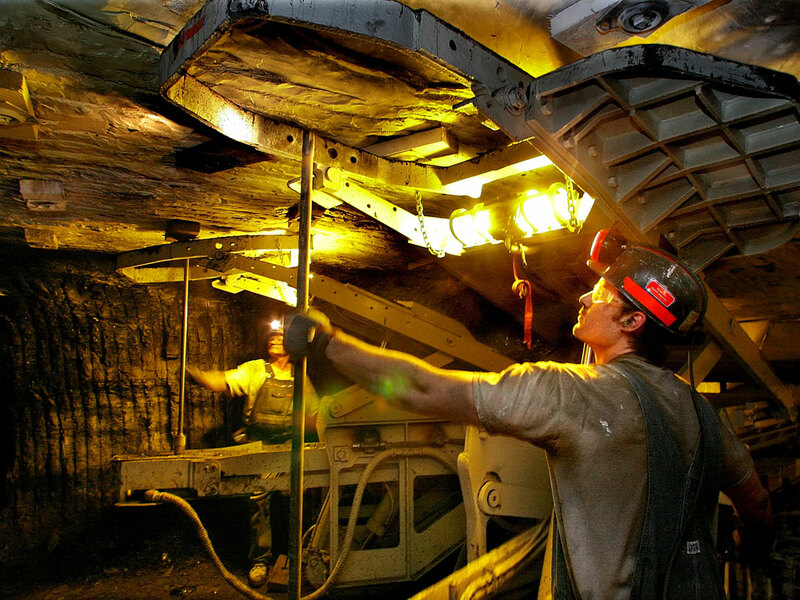 Coal miners work in a mine near Coulterville, Ill., in 2006. As residents of Montcoal, W.Va., mourn the deaths of at least 25 coal miners in the deadliest U.S. mining disaster in more than two decades, Americans may wonder why the country is still using a fuel that can be dangerous to produce and damaging to the environment. The mere word "coal" evokes images of miners emerging from mine shafts with the black rock that fueled the economic and social change of the Industrial Revolution. But despite the scientific and technological breakthroughs of more than 200 years, coal continues to be an important fuel in the 21st century. The U.S. produced about 1 billion tons of coal last year, and about half of the nation's electricity is generated using coal. Craig Pirrong, an energy expert with the Global Energy Management Institute at the University of Houston, says coal is not a relic of the past — it's also part of our future. Given the environmental and safety issues, why do we still mine coal? In a world where carbon emissions are not taxed, coal is a very inexpensive and efficient way to generate electricity. Coal is also one of the most abundant energy sources in the entire world, and it's relatively efficient for generating electricity. Last year, the U.S. produced about 1 billion tons of coal, and only about 6 percent of it was exported. Most of the coal we export is used for steel production. We do import coal, but our imports only amount to about 2 percent of what is produced domestically. Coal is used to generate about half the electricity in the United States. Aside from its use in generating electricity at power plants, how is coal used? There are two kinds of coal: steam coal, which is used to generate electricity, and metallurgical coal, which is used in the production process for certain metals — especially steel. Virtually all steel utilizes coal. Steel is an alloy of iron and carbon. Coking coal is a source of carbon in the smelting process. What countries are the biggest users of coal? China is the biggest consumer of coal in the world, followed by the United States. The U.S. consumes about 1 billion tons of coal per year. China consumes about 1.6 billion tons for electricity generation and heating. The Chinese are building electric power plants at a furious rate, and most of those plants are fueled by coal. The coal industry says new technologies have made coal cleaner. What is "clean coal"? Coal emits pollutants, including sulfur compounds, ash and carbon dioxide. "Clean coal" is a broad term referring to a variety of technologies that reduce the emission of pollutants, through treatment or processing of the coal, changing the way it is burned, or sequestering the pollutants. What are the projections for the future use of coal? That's really up in the air. It will depend upon whether we use cap-and-trade as a means of putting a ceiling on the emission of carbon dioxide and other gases that contribute to global climate change. Under such a policy, there would be a cap on greenhouse gas emissions from most sources, including electric utilities. Such a policy would tend to reduce the amount of coal used, because burning coal produces large quantities of carbon dioxide. But given the worldwide reliance on coal to generate electricity, it is likely that large quantities of coal will be used for the foreseeable future. What energy sources could be substitutes for coal? The closest substitute for coal in electricity generation is natural gas. Recent technological breakthroughs have made natural gas extracted from shale more available, but that will not eliminate the use of coal. It's unlikely that we will dramatically reduce the use of coal in the medium to long term. Half of the electricity in the United States is produced from coal. In China, two-thirds of all electricity is generated by coal. Coal is going to be around for a very long time. Despite all the talk about alternative sources of energy, there's no real alternative on the horizon.